In a numbers-driven league, touchdowns, interceptions and sacks are oft-used to objectively evaluate player performance. Of course, Pro Football Focus goes beyond the box score to provide advanced statistics and grades that more accurately convey how a player has performed in any given game, season, career, etc. 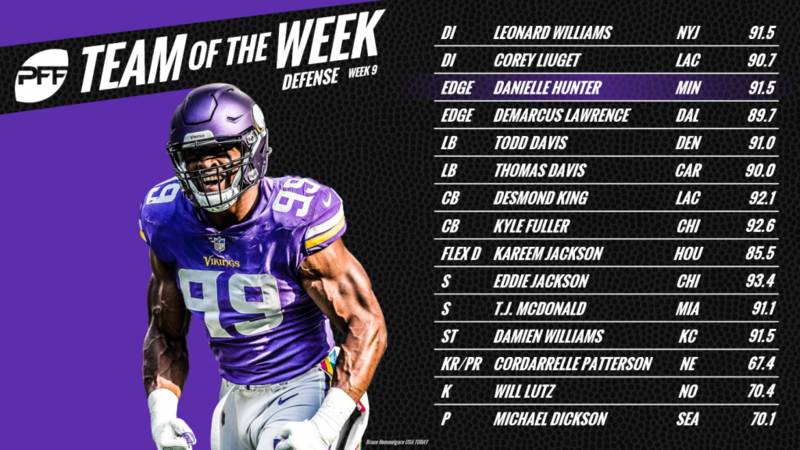 Here, we’ve looked past box-score totals and unearthed the hidden gems in the PFF databases that are key stats to know following Week 9 of the 2018-19 NFL season. Through Week 9, ranks first among all NFL running backs with 50-plus touches in percentage of touches resulting in a first down or touchdown (42.3%) and second in yards per touch (7.62). 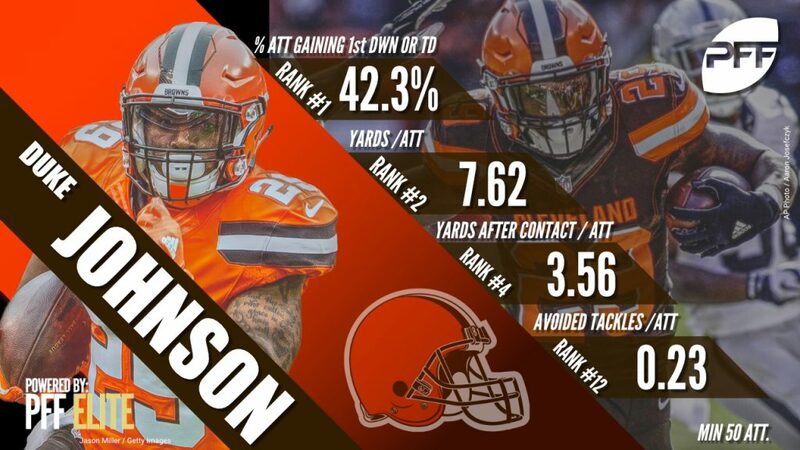 In terms of creating yards on his own, he ranks fourth among the same group of backs in yards after contact per touch (3.56) and T-12th in forced missed tackles per touch (0.23) – two impressive figures for a 5-foot-9, 210-pound back with limited touches. Among the 89 cornerbacks with at least 20 targets when the opposing quarterback is working from a clean pocket, Chicago Bears’ Amukamara ranks first in passer rating when targeted (60.8). Donald leads all defensive interiors and edge defenders with 100-plus pass-rush snaps in win percentage (27.4%) through Week 9. He’s having an even better season than his DPOY campaign a year ago. Among the 44 running backs with at least 25 carries on which they’ve been contacted at or behind the line of scrimmage, Browns’ Nick Chubb ranks first in yards per carry (2.5) on such runs. He also leads the same group of backs in yards after contact per carry on such runs at 4.20. 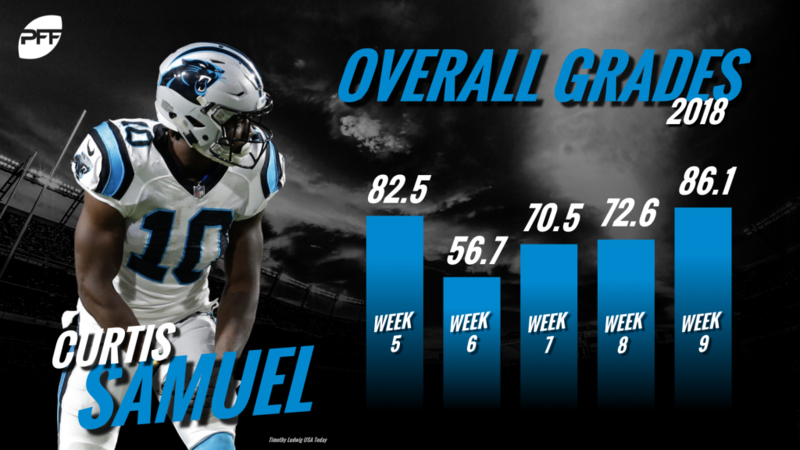 Samuel has a proven knack for making plays after the catch and forcing missed tackles. Among the 136 receivers with at least five catches this season, Samuel ranks first in forced missed tackles per reception and 30th in yards after the catch per reception (5.50). When defending offensive players running routes out of the backfield, 49ers linebacker Fred Warner has allowed just four receptions for 30 yards and two first downs from 10 targets this season, good for a league-leading 47.9 passer rating when targeted among qualifying linebackers. What Warner does against running backs, Matt Milano does against tight ends. Among the 41 defenders with at least 10 targets covering tight ends, Milano ranks first in passer rating when targeted at 61.0. Fuller was targeted eight times in the win over the Bills but allowed just one reception for zero yards in coverage on the day. With two pass breakups and an interception, he was a force to be reckoned with, allowing an NFL passer rating of 0.0 on throws into his coverage. Among the 21 defenders with at least 20 targets covering a pass-catcher from a slot pre-snap alignment, Fitzpatrick ranks first in passer rating allowed at 44.4. Through nine weeks, Peters has a 45.6 grade which ranks 106th of 111 cornerbacks, and his near-perfect passer rating allowed of 145.6 is 107th. He’s also already allowed more yards in coverage this year than in all of 2017. RELATED ARTICLE: What happened to Marcus Peters? Though playing in A.J. Greens shadow through the first nine weeks, Boyd leads all 53 pass-catchers with at least 20 targets of 10-plus air yards in passer rating when targeted on such throws (148.1). He’s caught 15-of-23 targets for 332 yards, 12 first downs and three touchdowns. 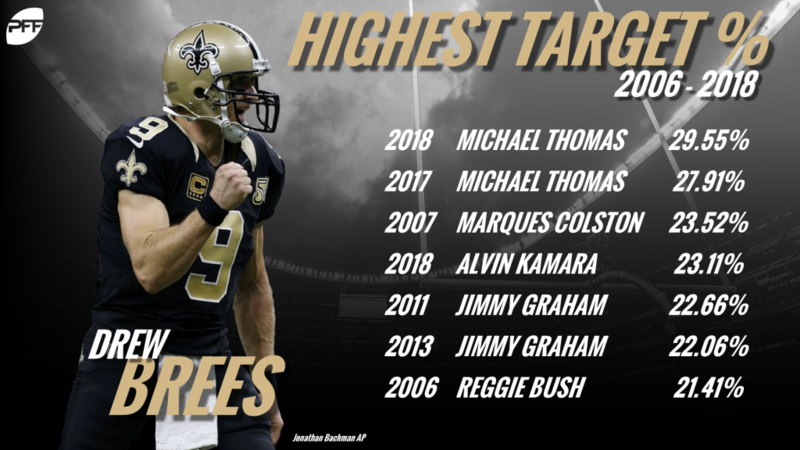 Brees has targeted Thomas on 29.55% of his attempts this season, the highest target percentage of any receiver Brees has ever thrown to in the PFF era (2006-2018). Thomas has done his part as well, reeling in an impressive 88.6% of his targets, which ranks first among receivers with at least 15 targets this season, and he’s produced a passer rating of 127.4 when Brees is targeting him. Raiders center Rodney Hudson has allowed just two total pressures this season, the lowest total for any offensive lineman with at least 200 pass-block snaps this season. Jackson has allowed just a 30.7 passer rating when targeted of 10-plus air yards this season, leading all 38 NFL cornerbacks with at least 20 such targets on the year. Darnold has a 50.9 grade through nine weeks, which ranks 27th out of 27 qualifying quarterbacks. It hasn’t been pretty, and Darnold’s league-leading 14 interceptions haven’t been, either.